The first step to a professional resume by BrandRed Resume is personalizing your order. 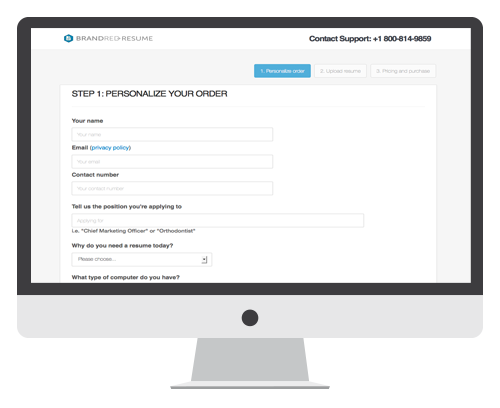 You'll complete our short order personalization form with information we'll need to make your resume order custom. You'll be providing us with simple information, such as your name, email, the position you're wanting to apply for, and your salary expectations. Upload your old resume and make payment. For step 2, you're going to upload your old resume document via our "Resume Upload" form. You can insert missing or updated information that we'll need to complete your custom professional resume project on this same form. 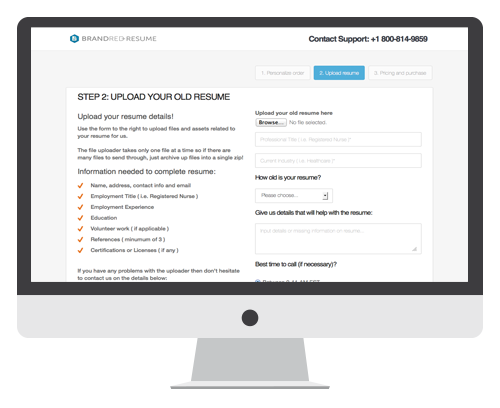 The Upload form will outline exactly what we'll need to craft your new resume (most of this will be on your old resume). Next, you're going to choose the exact resume marketing documents you need and pay for your resume order. We provide several services, so pick only the services you're interested in purchasing (i.e. resume and cover letter, thank you letter, etc). Review and approve your resume draft. We know how serious you are about your career search. That's why within 24 business hours of successfully paying for your resume order, we send you a first draft of your resume. This first draft is the first 33% of your new resume. We provide you with this draft so you can approve of the formatting and content being used to market you to hiring managers and recruiters. 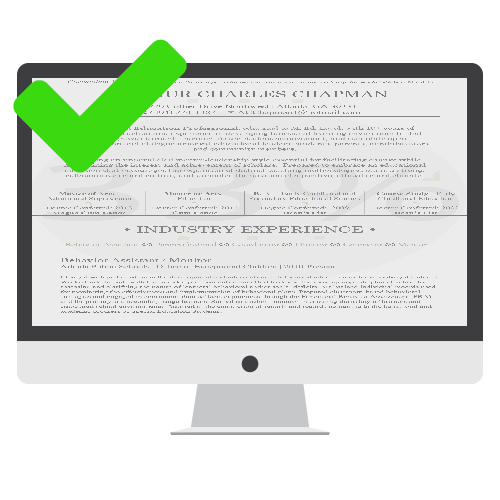 Once you approve your draft, we move forward with completing your resume document(s). Receive your new resume within 2 business days. Within 2 business days of receiving your approval for your resume draft, you will receive your new resume and career marketing documents (if you ordered additional documents) in your inbox. We send you your document(s) via email and you have the option of having them mailed to you for a small fee. 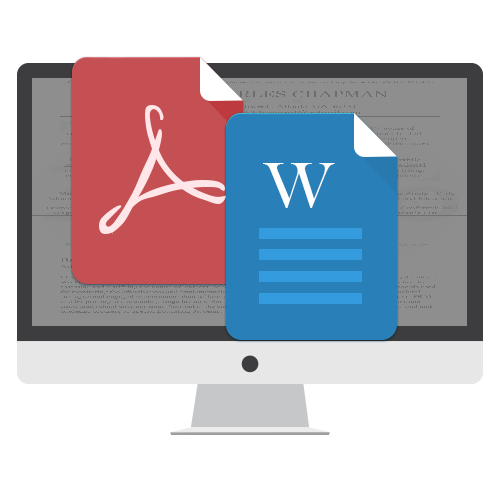 Resume documents are sent in both Word and PDF formats and all other career documents are sent in Word format only. Once you receive your resume document(s), you are given a 12-hour review period where you can request any minor revisions you feel are necessary. Minor revisions are provided at no cost and your updated resume is delivered within 48 business hours. Revision period varies for promotions.